The ESCC is a partnership between CYCLE TORONTO and the LAKESHORE PLANNING COUNCIL CORP.
Much has been accomplished by this group over the past several years. Focus has been on SAFE RIDES TO SCHOOLS and working with the Toronto District School Board, and in particular with Trustee Pamela Gough in Ward 3, to promote cycling for school children for the health benefits and to reduce car trips to schools during the school year. ESCC has promoted safe cycling education for students and good quality, functional and secure bike racks in sufficient numbers to accommodate bicycles for students. 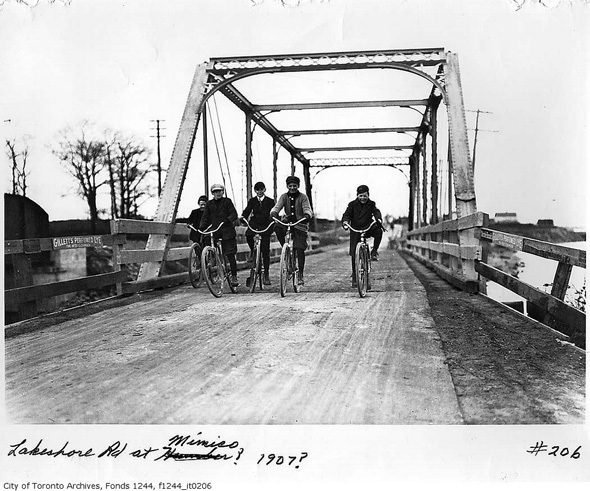 Members of the ESCC have also created fantastic HERITAGE BICYCLE RIDES for the South Etobicoke communities, and are looking forward to doing more of these in the future. This great idea has now been adopted by other communities throughout Toronto. The most recent activity concerns BECOMING A BICYCLE FRIENDLY COMMUNITY. A meeting was held on January 28, 2014, and all stakeholders in the community were invited to attend. “People who walk or CYCLE spend more money than drivers of cars at local businesses.” The brain-storming session brought forward some very interesting ideas! Please see the flyer below and stay tuned for Minutes of the meeting and more to come.